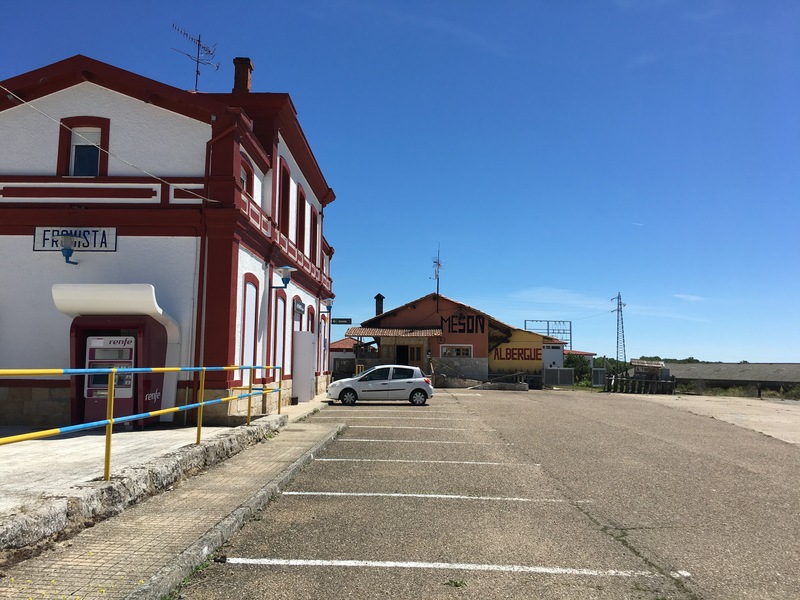 Today I’m in Fromista, a town on the high plateau, known as the meseta. I’m staying at an albergue (a hostel) that’s behind the train station. It’s a quirky place run by a young woman named Tatiana who is giving me all kinds of advice. I asked her for a lemonade and something small to eat, and she said no, if you snack now you won’t eat your dinner, and I don’t want you to waste food. She also told the woman I’ve been walking with that since she was done in from the heat, she should save her health and take the bus to the next town tomorrow. She reasoned that you can’t buy good health, and if you over do it because of pride, you’ll never reach Santiago. On the meseta it’s cool at night, about 45 degrees, and the cool air lasts through the morning, until about 11:00. The smart pilgrims wake at 5 am and finish by 11:00 or 12:00, but I’m so slow in the morning. Often I’m the last person to leave the albergue in the morning. I need to put on sunscreen, make sure my phone is in my right pocket, passport and money in my secret pocket, and my pilgrim’s credential in the left pocket. Once I begin walking, I take a while to warm up. I go slowly. I notice my surroundings, take pictures, and stop in almost every little town to have a cafe con leche or a snack. But by late afternoon, when I’m one of the few people left on the road, the sun beats down. It’s a dry heat, but there’s no shade on the meseta, and the sun crisps the skin and the air. The way is flat. If you stand still, all you can hear is wind rustling the wheat and birds singing, hidden in the grass and shrubs. If you look out at the fields, it feels like you’re on the edge of a vast ocean of wheat. In the far distance you can see the last curl of the Pyrenees as it rolls into the northern coast. Funny on the Tatiana woman. She doesn’t mess around, no? Si. Ha! I s’pose you did forgo the lemonade and snack. As for the description of the mesata, cool and hot, no? Si. I have wondered how it was after reading the book, Walking in A Relaxed Manner. Smiling. 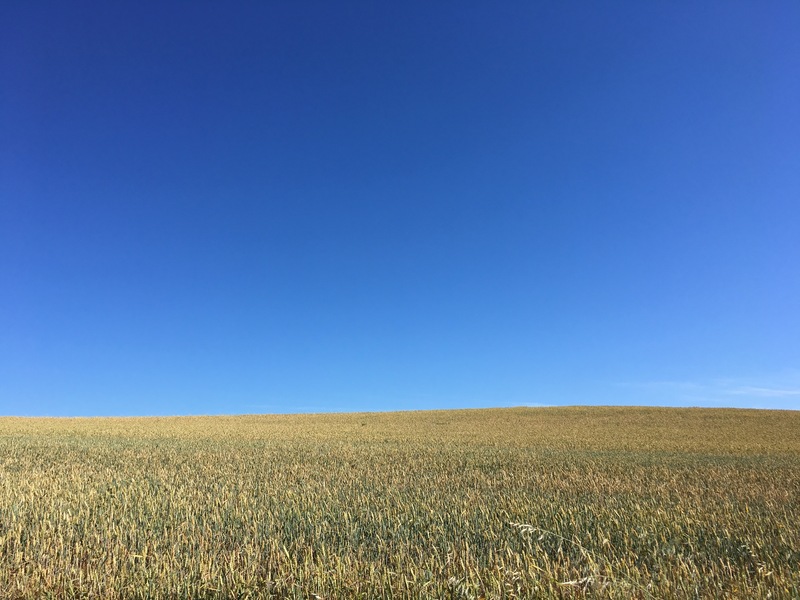 Nice rundown for an armchair traveler like me and the picture of the vast blue sky over the fields of wheat is powerful. I like very much. Keep on trekking and sprinkling in the “day in the life” of your journey, Camino C.